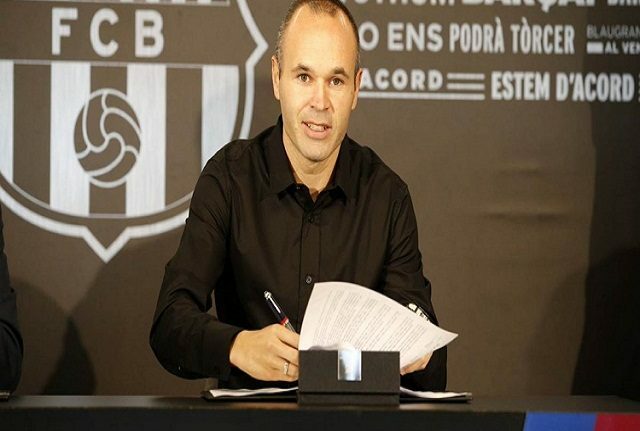 There are some very strong pointers that Manchester City are gearing up a move for Barcelona legend Andres Iniesta to replace assistant coach Mikel Arteta who is likely to become Arsenal manager. Reports in recent months have linked the 34-year-old with a move to the Chinese Super League, Major League Soccer and even the A-League. But Yahoo has put the brakes on those mooted destinations, suggesting that Iniesta could join back up with his former Barca manager Pep Guardiola at Manchester City as a player-coach. It is believed that the Spanish international is Guardiola’s number one choice to fill the void left by Arteta who is expected to be confirmed as Arsenal manager later this month. It would be recalled that the world-class midfielder confirmed last month that he is leaving Barcelona after 16 seasons. The 33-year-old revealed he was in contact with Guardiola as he mulled over his options for the next career move. However, a refusal to turn out against Barcelona – who City have played six times in the last five years in the Champions League – meant the playmaker would not consider moving to another European club. “Pep [Guardiola] sent me messages yes, but there are some reports that I don’t understand,” he told Radio Marca. “I won’t play against Barcelona. My time in elite football ends at Barca. There are two scenarios, China and Japan…the best choice will be made. 0 Response to "Iniesta To Replace Arsenal-Bound Arteta At Manchester City"